For the quarter ended Dec. 31, the company, which reports in euros, posted the approximate equivalent net income of $1.8 billion, or $1.66 per diluted share, compared with $3.6 billion, or $3.34, a year earlier. Revenue climbed to $53.1 billion compared with $49.6 million a year earlier. The WLTP, or Worldwide Harmonized Light Vehicle Test Procedure, laboratory test is used to measure fuel consumption and carbon dioxide emissions from passenger cars as well as their pollutant emissions. Mercedes-Benz Cars, Daimler’s largest division, posted quarterly sales of 627,601, up 3% from 606,503 a year earlier, reflecting softer sales in North America. Daimler shares fell 1.9% to $59.14 after the earnings release. Meanwhile, Daimler sold 143,524 trucks in the quarter globally — 7% higher compared with a year earlier — and a record 517,335 in the 12-month period and 10% higher than the previous period. The truck segment’s quarterly earnings before interest and taxes — the measure of operating profit at Daimler — rose 27% to $809 million compared with $637 million. EBIT at its bus division increased 33% to $150.4 million, but EBIT was down in all other divisions. The truck segment’s higher earnings came primarily from higher unit sales in North America and efficiency improvements — offset by currency exchange rates, the higher cost of raw materials and additional costs resulting from bottlenecks in the supply chain. 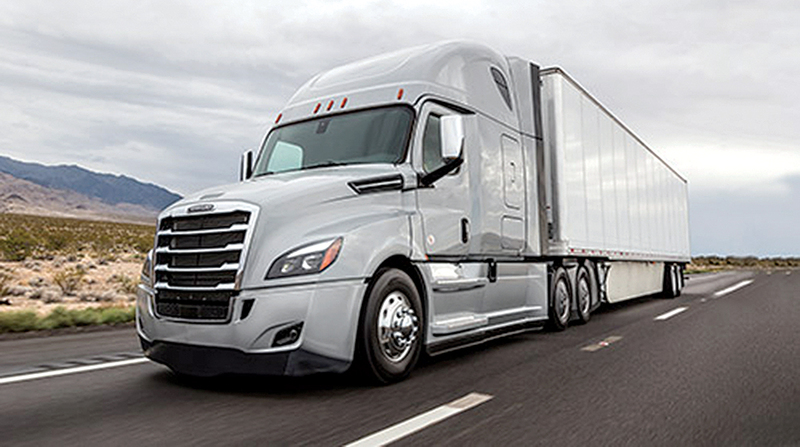 In North America, its largest truck market, retail sales increased 12% to 53,093 trucks compared with 47,603 a year earlier, according to Stuttgart, Germany-based Daimler, which is the parent company of North American brands Freightliner and Western Star trucks and Detroit Diesel Corp. The product highlight at Daimler Trucks was the world premiere this fall of the Actros model in Europe with its connectivity, active safety systems and cameras that replace the exterior mirrors, according to the company. At the same time, “[Daimler] will continue to drive forward the four key future fields of our industry: connectivity, autonomous driving, sharing and electric mobility,” Zetsche said. The Feb. 6 earnings are the last for veteran Zetsche, at the helm since 2006. Credited with a pivotal role during Daimler’s divorce from Chrysler and a successful product overhaul, ongoing investigations into diesel-emission practices have weighed on his tenure, according to Bloomberg News. This summer, Daimler halted deliveries of one type of diesel engine for Mercedes-Benz trucks over their emission setup, less than a month after recalling 774,000 autos with prohibited shutoff devices, Bloomberg reported. The truck engines could “slightly” exceed nitrogen oxide emission limits under certain conditions, the company said at the time. Subsequently, Daimler agreed to upgrade the diesel-emission software in Vito vans, the GLC SUV and C-Class sedan, escaping costly fines, according to Bloomberg. Full-year net profit at the company fell to $8.6 billion, or $7.73, compared with $12 billion, or $10.95. Revenue grew 2% to $190.2 billion compared with $186.8 billion in the 2017 period.